As this offseason confirms, the way in which clubs spend their money has changed perceptibly over the last decade or so. Where it used to be commonplace for an organization to pay a player for what he had already done, teams have increasingly begun to compensate players for what they’re likely to do in the future. We see the emergence of this trend most clearly in long-term extensions for younger players, a development that has led to missing free-agent classes. Of course, that doesn’t mean clubs have stopped signing free agents altogether or stopped exposing themselves to risk of any kind. Teams still need to address weaknesses, and one means to do that is by way of the open market. 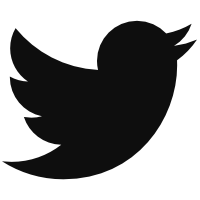 In some cases, the performances they expect fail to materialize. In some of those cases, teams decide they’re better off paying someone else to take care of the problem. This is how teams end up with dead money on their payroll. Money paid to players who have been released. Those players are free to sign with other teams, but the team releasing the player still owes the money remaining on the contract. Money paid to other teams as compensation for players who have been traded. Generally, we see teams cover a portion of a contract to receive a better return in trade. Money paid to players who are still in the organization, but who have been removed from the 40-man roster. Any team could have claimed these players if they were willing to take on the contract, and the player probably could have elected fee agency, but then he would forfeit his right to the guaranteed money. Last season, nearly $300 million of MLB payroll was of the deceased variety, a sum that was double the amount of the prior campaign. Over the past year, we’ve seen the contracts of Carl Crawford, Josh Hamilton, Jose Reyes, and Alex Rodriguez all come off the books. The result is a $100 million decrease in the amount of dead money from last year. The graph below shows the teams who are paying the most money this season to pay players not on their roster. Boston takes the top spot this year thanks entirely to Rusney Castillo and Pablo Sandoval. The Los Angeles Dodgers’ dead money, meanwhile, is spread out over seven players. Because of their original trade with the Padres that removed Matt Kemp from their roster, they are actually paying an amount higher than his current salary after having reacquired him. And the Dodgers would actually place higher on this list if they had released Adrian Gonzalez instead of taking on Matt Kemp’s contract when their former first baseman was dealt to the Braves and then released. The team could also still increase its total if the front office decides Kemp is not a fit for the current roster. Breaking the money down by type, the table below shows players who were traded with payments from their former teams. As the table here indicates, the Padres are responsible for the largest subsidy in the league right now. They’re also probably more than happy to pay it, in light of their return: San Diego agreed to pay part of James Shields’ future salary and received Fernando Tatis Jr., the fifth-best prospect in all of baseball. Many of the deals above feature relatively small amounts to help offset payments for quality players like Hamels, Leake, Longoria, McCann, McCutchen, and Verlander. In no case was the money likely central to a deal, but it helped sweeten things enough to move both sides to an agreement. Luis Avilan might not technically belong on this list. He was moved from Los Angeles to the White Sox along with some cash so that the Dodgers would receive reliever Scott Alexander from the Royals. The real money in the deal came from the Dodgers and Royals to the White Sox to help pay for Joakim Soria, but because Avilan started with the Dodgers, the $2 million technically goes with him. The traded players above account for around $70 million, and the group of released players below account for roughly that same amount, as well. The Dodgers paid some money to the Braves in the big contract swap this winter, but even after that payment, Gonzalez was still owed a hefty sum. The amount owed to Prince Fielder accounts for money the Rangers are receiving from insurance following Fielder’s forced retirement from the game due to injuries. Brandon Moss is still looking for work, while the small figures for Anibal Sanchez and Ezequiel Carrera were due to their release during spring training. The final group of players is composed of guys still in a team’s system, but not good enough for a spot on the team’s 40-man roster. Of the four players here, three were signed to big contracts out of Cuba. Of particular note with regard to those three players is that, because they don’t appear on their respective clubs’ 40-man rosters, their salaries are not counted towards the competitive balance tax. The Dodgers are likely to stay under the tax amount this season in part because their payments to Arrabarruena and Sierra do not count. The Red Sox were able to get under the tax threshold last season because the salaries of Castillo and Allen Craig did not count. The Red Sox’ liability will be lessened this season so long as Castillo is not added to the 40-man roster. As for Singleton, he will not be paid $2 million this year as he is serving a 100-game suspension without pay for a drug of abuse. The Astros are nowhere near the tax threshold for payroll, but if Singleton were on the 40-man roster, he likely wouldn’t have been suspended, as Major League Baseball does not test for marijuana. 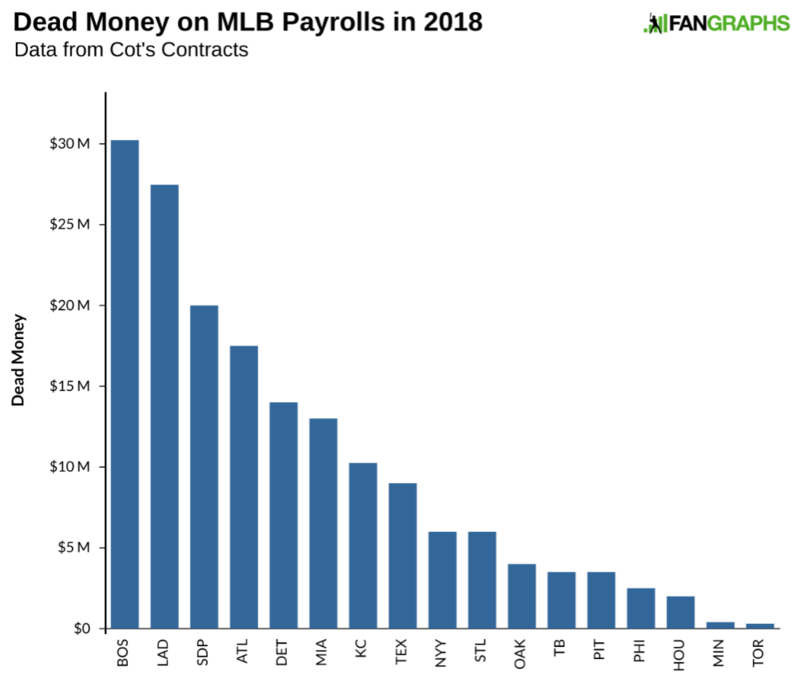 While the Dodgers and Red Sox have the most dead money on their payroll, they do not have the highest percentage of their payroll on the same. For the second consecutive season that honor goes to the Padres, as the table below indicates. For a vast majority of teams, dead money isn’t too much of an issue this season. The Padres’ number should decrease a bit more next season, and the Dodgers will lose a couple salaries from their books, but the Red Sox will be paying Castillo and Sandoval for a few more years. If teams continue to find creative ways to trade payroll like the Braves and Dodgers did this winter or Padres Chase Headley plus prospect deal from the Yankees, we might see this effect lessened a bit in the future. We hoped you liked reading MLB Teams With the Most Dead Money in 2018 by Craig Edwards! Forget Bonilla, the Braves are still paying Bruce Sutter from his contract in 1985. That still has a few more years to go with a $9.1M lump sum payment at the end. Is this real? They still owe Bruce Sutter?????? If true, it puts Bonilla to shame. Oh yeah, in a move that was way ahead of its time, the Braves signed him for 6/$4.5M and then $1.15M per year for the next 30 years with a $9.1M lump sum at the end. Theoretically they were going to put the $9.1M in an annuity and interest rates at the time were like 12.3% (we’ve gotten used to low interest rates the last 10 years or so but they were crazy in the 80’s – mortgage rates were 12 to 13% in 1985). More than likely they didn’t and have simply been paying out of pocket ever since with the $9.1M kicker coming up in 2022. The Mets aren’t even the best at handing out absurd contracts! So, if I buy an annuity from an insurance company, the money they are paying me is dead money? They do get the use of the money that used to be mine, before I bought the annuity and became a leech.